Friday started with strong winds as we finished preparing the base. By around 1500 conditions were improving although the sky had the look of the impending warm front that was expected later that evening. Pilots started up the hill to Alcock Tarn. Once they started to fly it was obvious that there was lots of buoyant lift around. Malcolm Grout disappeared in the direction of Helvellyn and around 30 pilots had good flights. The rain came in during the evening and persisted for all of Saturday. For Saturday, Ed Cleasby and Richard Bungay set up 2 walking challenges based on turnpoint cylinders - a hard option and a soft option. This caused a considerable problem for the scorers as the paragliding scoring software couldn't cope with the slow speed! Sunday was a day with strong winds. The coaching group had the greatest success at Lowca where most pilots managed to fly. 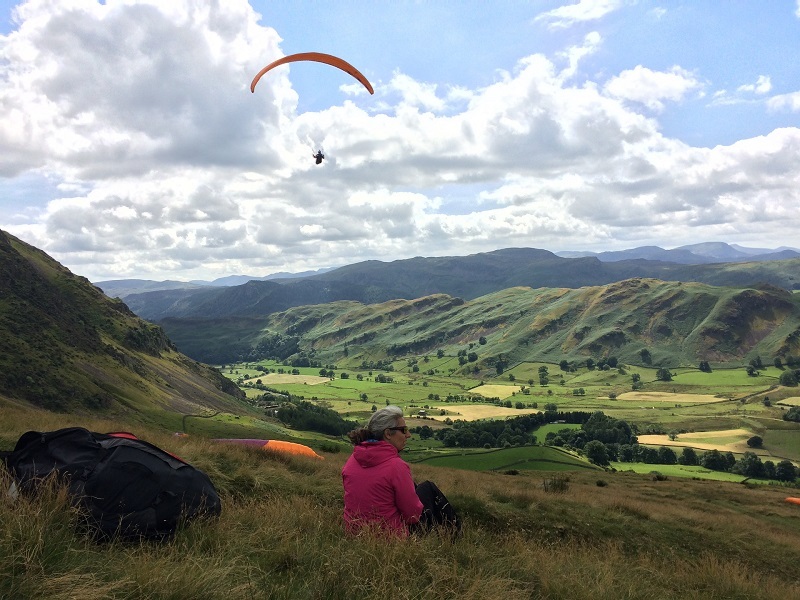 A competition was set for the A and B comps at Clough Head with some pilots managing to get to the south end of Thirlmere. Many thanks to Grasmere Showground for all their help and assistance over the weekend. It never poured, but it certainly rained. What a weather dominated sport paragliding is. You can nail down just about everything in the planning ……….. except for the one thing that counts above all others – some flyable weather. Yet, somehow, by dint of hardwork, uncomplaining participants and a sizeable slice of imagination we always seem to pull it off. 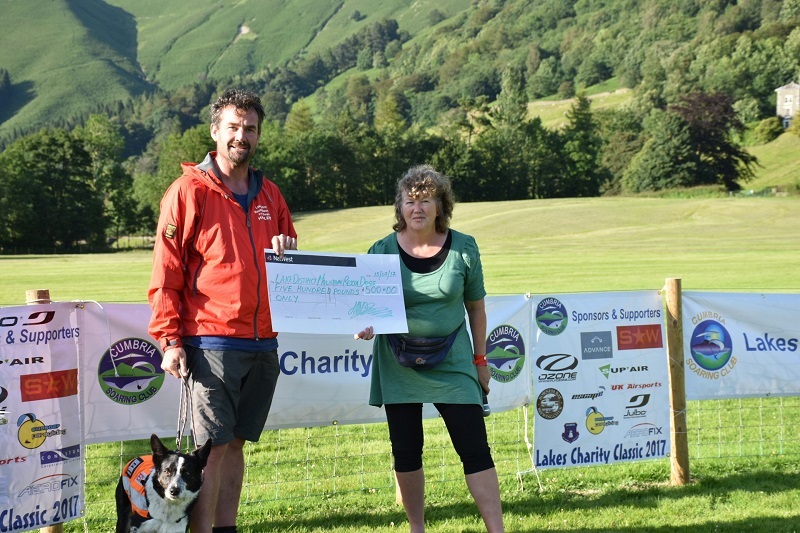 As we did the final wrap in a warm, gloriously sunny Grasmere – a carbon copy of the previous year, the realisation sank in that we had pulled off another successful LCC. Flying-wise, we had nothing to work with. The cloud hung low over the hills, the drizzle was unrelenting and 30mph winds scoured the summits. It could easily have been a day to cancel and forget. But this is the LCC and Cumbrians don’t let a bit of weather get in the way of a task. Following Richard Bungay’s excellent talk on tasking and gps related stuff we offered up a task to test listening skills, but above all fitness levels. This could have led to a mass roar of disapproval …. in fact it actually stirred the competitive streak in the hardy – or foolhardy, as they were to discover the painful way. We offered up two scoring tasks to all A and B compers. Both in the spirit of the recent x alps and probably all on foot. The ‘soft’ task (10k -500 points) kept people low, out of the mist and wind and was intended as a relaxing afternoon stroll. It was a bit harder than we thought. The ‘hard’ task (13k – 1000points) lead over the surrounding summits, a gruelling, weather lashed hike tagging various cylinders which would test the toughest. There was a bit more to it however with timing, route, tag order and loads having to be considered. It added to the fun, especially for the base watchers if someone had a tracker running (“The lazy bugger’s stopped, slowed down ….. get a move on …..”) Humour can be so cruel at times. Surprisingly, not one or two, but 16 opted to be briefed for the ‘hard’ task – and they seemed deadly serious. Then off they went up into the mists, some clad in lycra, skimpy shorts and underslung mini drink pack, (the fell runners) others in boots, full wet weather gear and sensible sized rucksacks (traditionalists). The ‘soft’ task saw a similar number set off on their tagging stroll. A zig zag around Wordsworth’s valley that gradually unfolded into something a bit more wearyingly than the afternoon relax they had expected. Maybe some wished they had joined the various shopping trips of the, ‘no exercise please, we’re pilots’ brigade. Back to the A comp. the drenching beads of sweat dripping from his face. Then a bit of a wait – the traditionalists had a more conservative approach to beating the fells. They were also a lot more sociable having formed small groups and shared trackers – just in case of rain malfunction. There was also the pairing of optimists – Aaron Binks and Tom Garner. Hoping for a late afternoon break in the weather they had carried lightweight wings. Their 12kg and 10kg packs were both a burden and a boon as each kilo bought 5 mins off their final times. It came in useful later for their scores. Perhaps I should also mention poor Geoff Moss. He missed the Helvellyn cylinder by 50m – he wasn’t happy that I moved the mountain slightly. Guessing cylinder centres is a dodgy business after three hours of walking. I think the lesson is just use the entered turnpoints, not a trig point on a map and a ruler. Yes, an odd task which many hadn’t signed up for ……….. expecting LCC they got something more akin to SAS. But it brought stories, laughs and added to the legend of the LCC. During mid evening a sorry group of Geordies trudged in after a gruelling 6hrs plus ……… I was cursed and hated with a vengeance. Only to be expected. Give them 20 years and I’ll be forgiven (maybe). We awoke to sunshine and a much better forecast. Still …………. despite, clear summits, thermals and no prospect of rain the wind could still be as much a stopper as mist and rain. We took both A and B comps to old favourite, Clough Head. It appeared to offer the best chance. use the bottom landing as goal. It was windy! Not unflyable, but enough to give many pilots second thoughts. The A comp had a task set around various turnpoints and were soon underway – or at least the bravest were. As the one hour window ticked towards a close and despite the great height some had they were finding it hard to get near the upwind start cylinder (my fault – make it bigger next time). The clock was ticking and the decision made to re-brief for a simpler task that took into account those airborne pilots. Richard Meek, Paolo Bellezze, Tom Garner and Pete Logan taking in Helevllyn as part of their tour. It was still windy at height, and not always comfortable flying but it was safe and all panning out nicely. With time passing 4pm arrived and the goal closed as we rushed to get everyone packed and back to base for downloads. Compared to Saturday the scoring was a lot simpler. Topping the table in first place was Richard (non walker) Meek with 26.11k, followed by Tom (walker with weight) Garner at 23.78k and squeaking into third, Paolo (always smiling) Bellezze. It all seems to have worked out despite the weather, no accidents discounting of course sore feet ….. and the usual crop of LCC stories. My thanks to the great people that come to the LCC each year and never complain – whatever we ask them to do. I have an idea for canoe racing around virtual, water-based cylinders on Windermere if it dares to rain again. 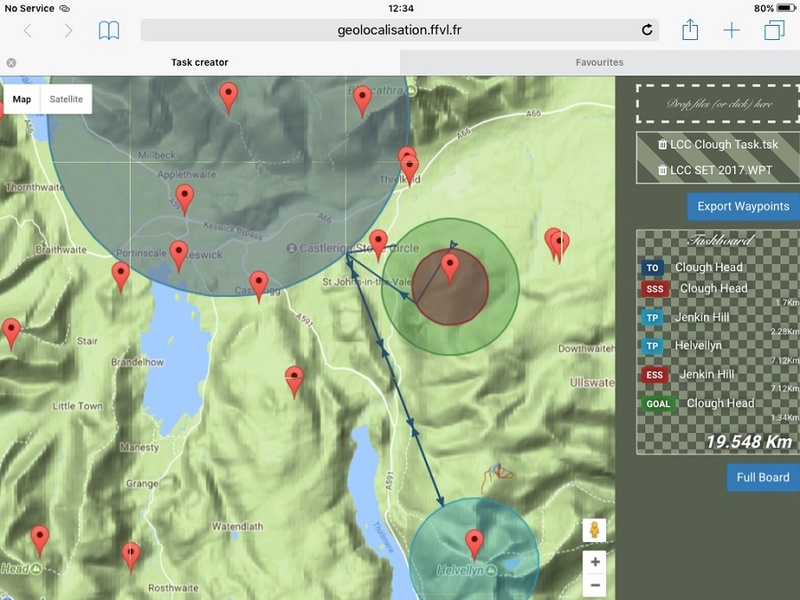 Following on from the GPS talk that gave hints on using your GPS for tasks and the shortfalls that catch pilots out a task was set around the valley. This was designed to be somewhat complicated to test pilots skills at programming and using their instruments and used predominately large cylinders to provide many route choices. All of the cylinders could be tagged at low altitudes if conditions were bad but this necessitated longer walks up the valleys. Generally there were much more efficient shorter routes that could be followed by venturing up the local fells to the Grasmere base. About 15 pilots ventured out to start the task, the multitude of different routes chosen was obvious from the very small number of fellow pilots we spotted on the task and those we did bump into were the same few over and over again as our chosen routes crossed. It seems my idea of "Soft" was not shared with everyone and done found it a lot harder than expected. In the end eight pilots (taken from latest results might need to be updated) made it all the way around the task covering a distance of around 13km despite the optimised flying distance being around 10km. I think pilots learnt quite a lot from the task and picking optimum lines and how their instruments work, but if nothing else it kept them from the bar for a few more hours. The big take from it all though is that or instruments and the scoring software is far from optimum for walking tasks! The Saturday forecast was looking pretty grim but thankfully Ed Cleasby and Richard Bungay had put together an “alternative” task for a rainy day. 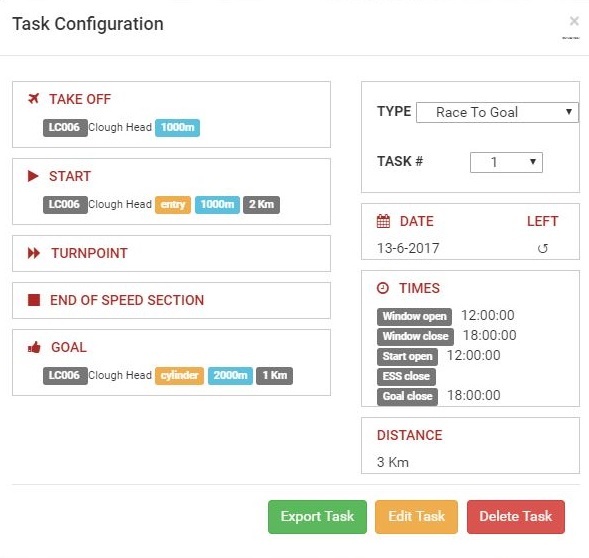 You can read about Ed’s “Hard” task under the A comp tab. And Richard’s “Soft” task didn’t turn out to be so soft after all! A number of pilots said it was a long hard walk. On Sunday morning, though it was forecast to be Westerly through most of the day it was NE to N on the morning. I played wind dummy and flew down from Alcock Tarn on a Northish facing spur to hopefully inspire pilots for the day. There were thermals and wind shear as I came down into the valley at 8:30. As the day developed it did turn Westerly, but also increased in strength. Both A and B comps went to Clough Head. I had the B comp pilots walk higher up on Clough than the A comp pilots (to which there was significant grumbling) but for good reasons: 1. I wanted some separation between the A comp and B Comp groups. 2. I wanted them to feel the full strength of the wind before deciding to fly. Even before setting the comp some pilots told me they wouldn’t fly as the conditions were too strong for them. A very wise decision. We originally set a task that would start from Clough out to a large cylinder around Jenkin which extended over Tewet Tarn. Then the next turnpoint was down the Helvellyn ridge to tag a larger cylinder around Helvellyn but kept them safely out of any of the more technical and rough sections of the ridge. The third cylinder was back to the Jenkin turnpoint and goal was a large cylinder around Clough which covered the landing field. As the start window approached and the wind speed picked up I was seriously considering canning the entire task. Thankfully, just as I was about to cancel the day, Mike Cavanagh suggested a much simpler task. An elapsed time task with launch and start being the cylinder around Clough Head and a the large goal cylinder around Clough Head with NO turnpoints in between. The task was to see who could get the greatest distance from the start cylinder out and return to goal. By the time the task was reset and a new start window set many of the B comp pilots had packed up and walked down. The wind did eventually lessen, but not significantly and the B comp pilots that launched all launched safely and had a challenging flight. Some, both in the A’s and the B’s, launched and went and immediately landed not liking the conditions. Everyone seemed to enjoy the day and everyone made good decisions measuring their abilities against the day’s conditions. As B Comp meet director I’d like to thank all the B Comp pilots for their great attitudes to two challenging days and also for the wise and safe decisions each pilot made whether they flew or not. In even a “fun” competition there can be added pressure to fly and I think this comp was a good, fun, and safe comp. Many thanks! People often talk about the LCC as a friendly flying competition but for me that’s not what it’s about. I’m very uncompetitive so for me it’s about helping pilots to enjoy flying in the Lake District; pilots who are newly qualified, fly infrequently or just don’t know the area. This year we had 15 pilots who put their trust in Ian, Malc and myself to give them the pointers they need to get the most out of their weekend. It was nice to see some familiar faces, with some people who were in last years group. Saturday was forecast to be a little inclement and so we took advantage of the weather with Ian Henderson leading a very informative talk on metrology for flying. Ian covered many of the topics pertinent to the pilot exam with the addition of it’s relevance to selecting the right site and flying in the Lake District. It was nice to have an interactive talk with everyone, including the weather taking part. In the afternoon we headed out to stretch our legs with a familiarisation visit to one of our most frequently used sites, Clough Head with the aim that when the coachees get the opportunity to fly the site in some better weather they know the important details about the site before they arrive. Sunday was a far brighter day. The forecast was perfect for flying the coast, but if the wind was anything less than forecast then it may have proved difficult for the 16 coachees to all stay up. We went to Lowca and found the wind to be slightly stronger than forecast at around 18mph. After the coachees gave a briefing of their observations about the site and assessed the weather we soon had lots of people taking to the air. Take offs were challenging in the strong conditions but people got some very good take off practise. When flying our coastal sites you’re normally treated to gorgeous smooth conditions and today was no exception. The coaches were each in the air for 1 ½ to 2 ½ hours enjoying the relaxing flying conditions and I’m sure that some of them only landed when they heard the chime of the ice-cream van that had clearly seen us and sought out some business. Everyone seemed very happy after their flights having landed safely. For the pilots who read right to the end of the programme of events they’ll have noticed that there’s a mention of the flying continuing on the Monday and this year, due to conditions and the availability of the right people a couple of the people that were in the coaching group joined a few of our coaches flying on Clough Head and Souther Fell on Monday and Tuesday. Cumbria Soaring Club would like to thank all of its sponsors and supporting organisations. Their generosity helps make the LCC a great event!